About two and a half years ago Darlene and I who are middle aged without children at home acquired a brown faced Capuchin Monkey. He was only two months old at the time. Darlene and her friend Diane drove to Salem and brought him back home to Redmond. He was so cute; it was love at first sight for me. He was so scared being in new surroundings and he was clinging so tight to Darlene and Crying just like a human Baby. We decided to name Him BENJI. Diane had purchased a small stuffed turtle for him to cling to on the way home, and that turtle was his security blanket for the next two and a half years of his life. Every where we went, he had to have his turtle. When we put him to bed at night in his carrier or when he was traveling with us in the car, the turtle was’ always there with his arm around it. As time went on, Darlene and I grew to love Benji so much, he was just a part of our lives. Every morning when we would get up, one of us would take him-into the shower with us. He would wrap his arms around my neck and hold on tight while I soaped him up. He liked the water almost too hot for me. If it was a little too cold, he would jump up on the shower stall, and wouldn’t come back until it was the right temperature He really loved his showers. He wore diapers with a hole punched in the back for his tail. We would buy him human baby clothes, small outfits that a baby or small child would wear, and with only a little modification had the little guy fixed up about as cute as he could be. Being a male monkey, we had him neutered at six months of age, and his sharp canine teeth were removed also so as not to cause any future problems. Monkeys are just like puppies, they like to chew. Benji was no different, and chewed on everything so we had the sharp canines removed. He was so intelligent; as he grew older he would learn more and more about everything around him. He was curious about everything that went on. Benji was always there watching everything I was doing with intense interest. Sometimes we would be careful not to show him things such as how to unlock something, or take something apart. If he learned how to do it, before long, he would be doing things we did not want him to do. When I would come home from work at night, Benji was right there untying and unlacing my boots for me. He learned how to do it by watching me and after that it was his job. Whenever I had a coke, Benji would go find his little plastic cup and run over to me to put a little in the cup for him. He would tip it up and drink it just like a little trooper and then hand the cup back to me for a refill. He had a beach ball, which was bigger than he was. He would go get it occasionally and throw it in my lap and then run back and wait for me to throw it back. He would tear off a piece of paper and bring it to me; I would wad it up and throw it way up in the air for him to catch. He would hand it back to me and watch intensely for me to throw it again. At Christmas time, Benji always had a lot of packages under the tree, from us and all of his friends. All of our adult friends were Benjis friends and every one would buy him gifts for him to open. I have lots of videos of him opening his presents. He was just as fascinated at opening presents as any human baby. He would tear off the paper, look inside, and then run for another one. I was constantly fascinated at his intelligence and his ability to learn. He ate what we ate. He had his own plate with a variety of fruit, meat and bread. Like any child, he loved candy, cookies, DI & M’s, Ice Cream and always shared Dad’s Pudding, both of us using the same spoon. When the pudding got down to the bottom, he would take the spoon and scrap up the last little bit off the bottom. He was in great Demand at our local library. They had classes for three to five year olds studying zoo animals and Darlene would take Benji down for a show and tell. He brought so much joy to a great many Children in our local area. A large number of people in the Llama Industry Nation wide knew Benji. Darlene worked with some of the bigger Llama Ranches grooming and showing Llamas and have attended most of the National Shows. Benji was always with her at these shows, hanging around the grooming stalls and climbing the fences while Darlene worked on the Llamas. He was always on a leash, or in a pet carrier. He was never allowed to run loose even at home. Darlene never went anywhere without him. He was her adopted son. Everywhere Benji went, he was always the center of attention. He brought so much joy to so many people. About the latter part of March of 1995, Darlene Started getting ready for a large Llama Show and Sale in Oklahoma City the first part of April. She intended to take Benji and as this was the first time he was to fly on an airliner she set about getting all of Benji’s Vaccinations and health tests in order. He had every vaccination available at our local health clinic and even had Dr. Robert A Willems, A Veterinary Medical Officer for the US Dept. of Agriculture drive over 150 miles from Salem Oregon to inspect Benji in his home environment. No stone was left unturned to get Benji Certified Healthy for this trip. 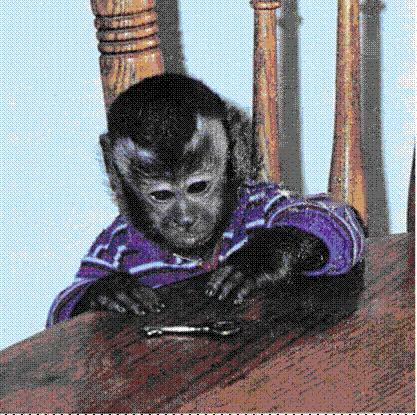 Different States have different laws about bringing monkeys into their states. California is the toughest State there is and Benji was in the process of being certified to go into California. Prior to the trip to Oklahoma he had been examined by at least three different veterinarians. All could find nothing wrong with him. All of these examinations took place within two weeks prior to them leaving for Oklahoma and the last tests were taken and read the day before they got on the Airplane. In addition to all of the Professional Veterinary Care, Darlene is a Certified Veterinary Technician with 15 years experience working in Veterinary Clinics. Benji had the most professional care an animal could get. On Tuesday, April 4, the big day arrived and I took Benji and Darlene to the Airport. As luck would have it, there was a problem getting Benji on the Airplane. Benji was supposed to ride in Cargo but the Small shuttle plane they were taking to Portland did not have a Cargo hold large enough for Benjis Carrier. The Captain of the plane came out into the Lobby and met Benji they talked to each other and Benji put his little hands out through the cage into the Captains hands. After meeting Benji, the Captain agreed to let Benji ride in a Closet which just fit his carrier for the trip to Portland. I said goodbye to Darlene and played with Benji a few minutes just before they got on the plane. Little did I know I would never see my little guy again. Darlene arrived in Oklahoma City later on that day. They stopped in Denver and Darlene watched while Benji was loaded onto another plane. The Llamas Darlene was working with had to ride from Oregon to Oklahoma on a truck so when they arrived, they were ready to be cleaned up and groomed for the shows on Saturday and Sunday. On the evening of Thursday, April 6, Darlene was working on a Llama in the back of a large animal barn at Heritage Place. It was late and most everyone else had gone home for the evening. Benji was on his leash and climbing around the corral fences while Darlene worked. Carol Hall, a food service worker at the Heritage Place, wandered back to where Darlene and Benji were working. 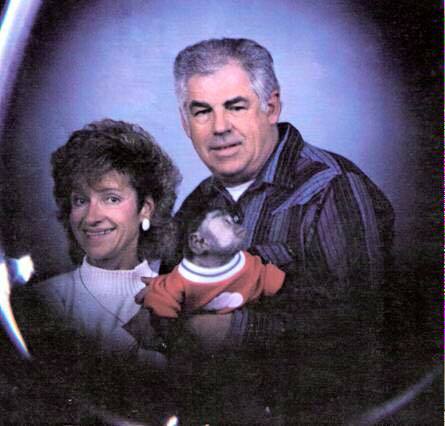 Darlene had told her earlier in the day she had a pet monkey so after work, she had to come back and meet Benji. Carol Hall told me she stood there and watched Benji climb around the fences for a while and then she moved closer. She held out her hand to Benji and he crawled up her arm. Benji would always go to strangers if they held out their hand; he was not shy at all. Carol Hall had a cup of quarters which Benji began playing with. He loved to play with money. At this time, for some unknown reason, Benji bit her on the chin. He had no canine teeth so the bite was more of a scrape but it did draw blood. Darlene helped her clean up the bite wound and she then went back to Norman Oklahoma where she lived. When she arrived in Norman, she went to an emergency clinic where she saw a Doctor there who cleaned the wound and checked her over. He told her he wanted to see her again the next day. He gave her some forms to fill out for the health Department. She saw Darlene the next day and told her the Health Department needed the information so Darlene filled out and signed the form. That evening she returned to the emergency Health Clinic and this time saw another doctor by the name of Eichman. He was concerned about Benjis health certificates and attempted to call the veterinary clinic in Redmond Oregon to get some background. Unfortunately for Benji, his Veterinarian was gone for the weekend and no one was there to fill him in. I learned of Dr. Eichman’s inquiries that same evening and immediately called him. He was very abrupt and demanding. I answered as many questions as I could and then called Darlene in Oklahoma City. She called Dr Eichrnan back and gave him all of the information about Benji, all of his shots, tests, etc. I went to bed that night feeling very uneasy about things in Oklahoma. The next morning Darlene called me and said she had decided to send Benji home and gave me the flight number to pick him up in Portland. About 30 minutes later, she called me back and told me the Animal Control People had taken him off of the Airplane and that they were going to Euthanize him. About 30 minutes after that, she called me back and told me our little guy had been put to death. I was to learn later the events that led up to Benji being put to death. Saturday morning while Darlene was at the airport putting Benji on a flight home, three female animal control officers from the Animal Welfare Division came to the Heritage Place office demanding to know where the monkey was. Roger Kirkham, a friend of Darlene’s, did most of the talking to the officers. They were very pushy and kept saying “This is a matter of life and death.” The time was 10:05 AM, Benji’s flight was to leave at 10:10AM. They finally learned Benji was on an airplane so they immediately called the airline and demanded that Benji be off loaded. Roger Kirkham was told by the Animal Control officers he could call an Oklahoma State Health Department Supervisor Laura Smithee and they gave him her number. She was the one who called animal Welfare and had Benji picked up. Roger called her and begged her to come down to the Heritage place and discuss what options there were. He was told at that time that we had no options and she was going to get an order signed by a commissioner to have Benji killed and his brain checked for rabies. She told Roger she was on her way to the Commissioner’s house at that time to get the order signed. She hung up because of another call but did call Roger back again. Roger again begged her to come down to the Heritage Place, meet with everyone and the victim and try to find an option to killing Benji. She told Roger if we could get an attorney to the commissioner’s house and file some kind of paper it could delay things but that there were no options and she would get the Order signed. Again the conversation ceased because she had another call. Roger talked to her again a third time. This time she said she had already gotten a signed order from the Commissioner to kill Benji and there were no options at all. She then asked for verbal permission to kill Benji but that it didn’t matter, she already had a signed order. Roger handed the phone to Darlene who was a total basket case by that time. Her one thing in life she loved most of all was about to be destroyed and she was told by Laura Smithee that there was nothing she could do about it. They already had Benji in Custody. Darlene was told that it was a life or death situation and they wanted her permission for the euthanization. Darlene said, “Well if that’s what the law requires, go ahead and do it, I don’t want the woman to die.” She then requested that we be allowed to claim Benji’s little body. She was assured they would keep him for us. We have since learned through interviews by a Private Investigator that Laura Smithee lied to Roger that day. She pretended to be on a car phone en route to the commissioners house to get a signed order to have Benji killed, when in fact she never left her house the whole time. She told Roger on the third call she had in her possession an order Signed by the Commissioner of health J. R. Nida, when in fact she made up that story also. She never left her home. All the coercion was done from her home phone. She made Roger, Darlene and everyone else at the Heritage Place office that day believes there were no options. We have since learned through interviews that there were options. Jerry Nida, Commissioner of health stated to our investigator that on occasions if an animal is rare or valuable, and every one agrees, the owners of an animal may elect to pay all expenses for the victim to have the rabies vaccine. Shortly after that phone call, Laura Smithee, without leaving her home, called animal welfare to go get Benji, talked to Roger Kirkham, led him to believe she was en route to get an order signed, talked to him again on two other occasions, the last time telling him she had a signed order by Commissioner Jerry Nida, and Darlene might as well agree to the euthanization because they were going to do it any way. She called the Animal welfare people told them she had a verbal Order to kill Benji. He was dead shortly after arriving at the animal welfare department. She did not give us any time to do anything to try to protect our little guy. Roger Kirkham begged her to come down and discuss any options. She told him we had no options. Her own boss, Jerry Nida said we did have options. Carol Hall said she did not want Benji destroyed. Laura Smithee was not interested in leaving her home that day. She wanted to get everything done on the phone. It was Saturday. If we had been given the options told to our investigator by Commissioner Jerry Nida, I would not have hesitated to write the victim a check for $10,000.00 or more if that is what it took to save Benji’s life. Laura Smithee had only one thing in mind that day, it was Saturday, she refused to come down and meet with the principals and the victim to discuss any options, in fact she manufactured a story to make everyone believe she had a signed order from the Commissioner and there were no options. She just did not want to leave her home that day. It was Saturday. A short time after we had our tragedy, Oklahoma City had a tragedy of their own. Someone blew up the Federal Building. I sat at home at night and watched the pain and suffering of the parents whose children were killed in that blast and I can absolutely guarantee they are suffering no more than Darlene and I have suffered at the loss of our Benji. Their Children were taken away from them by an uncaring, unfeeling, heartless individual. I fail to see very much difference between their case and ours. Benji tested negative for rabies as everyone knew he would. Our local funeral home in Bend Oregon made arrangements for Benji to be cremated and his ashes sent back to us. He was a little person to us, and all of his human friends would treat him like one. Since his death, Darlene and I have received over 30 sympathy cards from his friends and ours, and they keep coming in every day. When something like this happens, one has to wonder what is God’s purpose. When a little animal like Benji who during the short 2 1/2 years of his life brought so much joy to so many people. He never did anything to deserve his fate; his only crime was biting a stranger who had intruded uninvited into his private space. The bite was so minor it hardly broke the skin, more of a scrape than a bite. He was a domestic pet, always on a leash or in a cage or pet carrier. He was never allowed to be with other animals outside, so there-for no exposure to rabies. The authorities in Oklahoma did not even attempt to do any type of investigation as to where he came from, who his parents were, or make any attempt to determine what risk if any there was. Roger Kirkham begged the state health department officer Laura Smithee to please come down to the Llama show, meet with the persons involved discuss any options if any, meet with the victim. She was not interested in talking at all, told Roger there were no options at all. It was Saturday, she was at home, and was not interested in doing any investigation. We have since learned through our investigation that there has never been a recorded instance in the United States where a Monkey has ever transmitted rabies to a human being. In other words, if Benji had been rabid, he would have been the first ever. When we look at who has the most value to society, Benji, who gave nothing but joy to so many people, or the unprofessional people at the Oklahoma State Health Department who only had one purpose in mind that day, to capture and kill our pet, our foster son, our biggest joy in our lives. We are a Nation conceived by our for fathers to be a place where all men of pure heart and soul may reasonably expect to be treated with fairness when it comes to the seizure of our private property. We have the right to expect our public officials to act only when they have a reasonable and just cause to do so. No attempt was made by any public official to investigate the incident or examine any health certificates. Benji was never given his day in court, or even time to be represented by an attorney. He was dead within minutes after being taken into custody, even though he was loved and cherished as much as any human baby by his parents and friends. I really do not think that’s the American way. DO YOU? Well the letter I was sort of expecting finally arrived. Carol Hall hired herself a lawyer and will attempt to profit from our misery and heartache. She told me when I talked to her on the phone the other day that she had been approached by an attorney who told her he could make her a lot of money with this case. She told me she was not the type to sue people and wasn’t interested in that. Guess she changed her mind. Her attorney knows that all he has to do is file a suit with any type of claim of damages, and my insurance company will pay them something to go away.